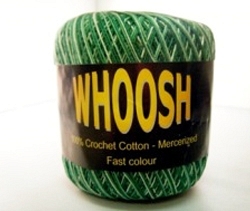 Whoosh Crochet Cotton. 6x53g Balls. Varigated Colours. Estimated Delivery Time For This Product Is Between 3-5 Days. 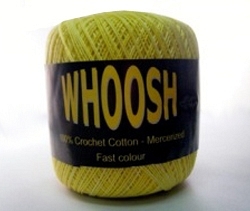 Whoosh Crochet Cotton 6 x53g Balls. Green And White. 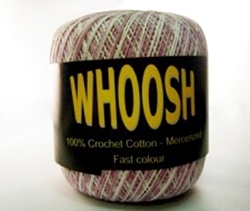 Whoosh Crochet Cotton 6x53g Balls. Mixed Blue. 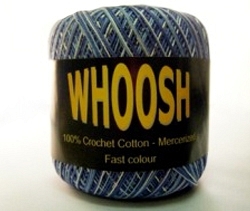 Whoosh Crochet Cotton 6 x53g Balls. Mixed Green. 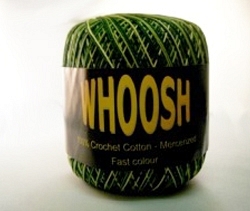 Whoosh Crochet Cotton 6 x53g Balls. Mixed Red. 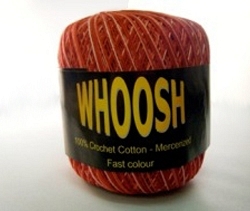 Whoosh Crochet Cotton 6 x53g Balls. White And Lilac. Whoosh Crochet Cotton 6 x53g Balls. White And Pink. 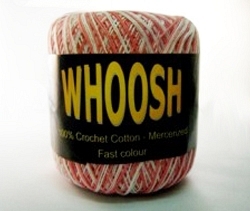 Whoosh Crochet Cotton 6 x53g Balls. White And Yellow.